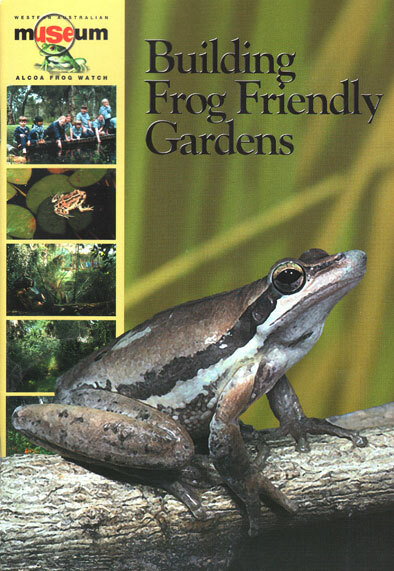 Building frog friendly gardens: a practical guide to encouraging frogs to visit and breed in gardens of southwest Western Australia. Artist/Author : Aplin, Ken, Anthea Paino and Lyndal Sleep. Teaches you everything you need to know about creating the perfect frog habitat in your backyard. Western Australian Museum, Octavo, paperback, illustrations. Artist/Author: Tyler, Michael J., Steve G. Wilson and Angus Emmott. 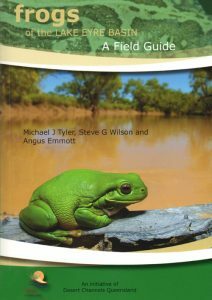 This excellent field guide covers the vast area of the Lake Eyre Basin of Queensland, Northern Territory, South Australia and New South Wales which covers about 1.2 million square kilometres, almost one sixth of Australia. The Lake Eyre Basin is a paradox, the country is arid and semi-arid yet contains some of the world’s largest rivers without an outlet to the sea. All creeks and rivers are ephemeral – they are mostly dry except for short periods after rain, when floodwaters spread across the country and make their way to Lake Eyre. Frogs are the often unknown and rarely appreciated story of the boom and bust cycles of Australia’s inland rivers. The ability of desert frogs to lie dormant for years in this driest part of the continent is one of nature’s wonders. And when the rains come, there is an incredible response, countless frogs seem to erupt from nowhere. This field guide beautifully illustrates the 44 native frog species of the Lake Eyre Basin, and one ubiquitous interloper, the Cane toad. The combination of text and images gives just enough information on each frog species, a credit to the three authors. Provides information on each species or group and is accompanied by a photograph and a distribution map. Also has fact panels throughout covering a wide range of topics. Other green guides in the series are mammals; parrots; spiders; birds; snakes and other reptiles; and sharks and rays. 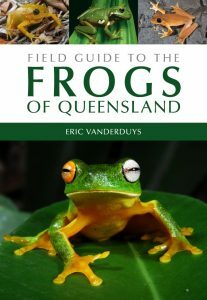 Provides a comprehensive photographic guide to the 132 species of frogs in Queensland, Australia’s most species-rich state. Species profiles list common and scientific names, as well as information on size, call and preferred habitat for each species. Many species of frogs in Queensland are threatened in some way and for these species, conservation status is given on a state, federal and international level. Generously illustrated with one or more photographs for each species, the book also includes distribution maps, line illustrations which demonstrate key features, and keys to each family, genus and species. 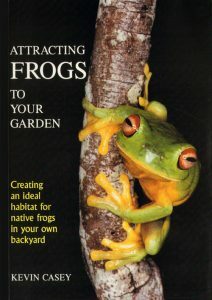 The must have guide for transforming a backyard into a welcome habitat for local native frogs. 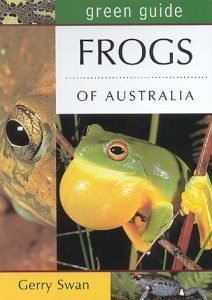 This charming book provides essential advice on tadpole raising, frog identification, frog-spotting techniques, frog calls and frog photography. Practical advice is given on building backyard frog ponds and establishing balanced garden environments.